A disabled woman missed her Ryanair flight due to the new luggage rules the airline has introduced and then collapsed at the gate. 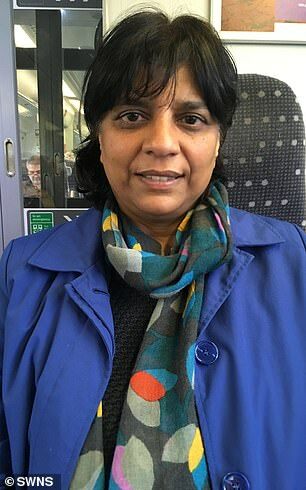 Awatef Ben Haj Fraj was due to board a Ryanair flight from London Stansted to Morocco yesterday afternoon, however when she arrived at the gate she was told by staff that she would have to pay for her hand luggage, despite having already purchased priority boarding. Mrs Ben Haj Fraj had checked in and arrived at the gate in plenty of time and had raised with staff at the boarding gate that she shouldn’t have to pay for her hand luggage as she had ‘read the terms and conditions’, which stated that the hand luggage was included in the priority boarding ticket. 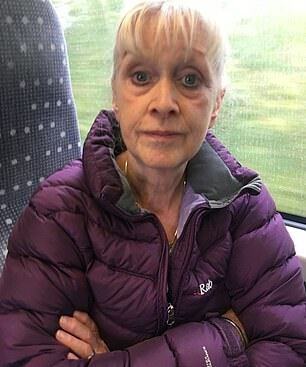 Mrs Ben Haj Fraj said she was then told to go to another gate, but when she arrived at the gate there were no Ryanair staff present to assist her. 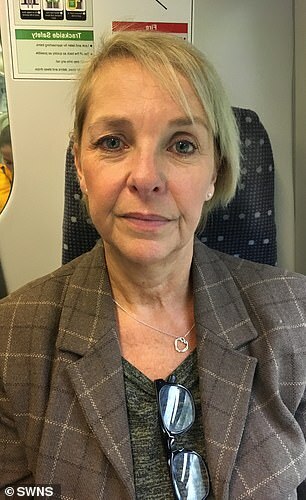 Mrs Ben Haj Fraj walked away from the gate, only to hear the staff members being rude towards her saying: ‘These bloody passengers, Swissport don’t pay me for this information, we’re leaving Ryanair soon thank god can’t deal with their passengers’. She said there had been no final call for her to board the flight to Morocco, which she learnt had then been delayed by three hours. Despite the delay, staff were unable to let her board the FR1364 flight to Radat. ‘I needed to get on that flight and I didn’t even end up going to Morocco because of this new policy. ‘The flight was delayed for three hours so they could have done something about it. I sat in the airport for two hours but they wouldn’t let me board the flight. Having missed the flight due to the new policy, she has now had to book onto another flight to Morocco, which is departing on Saturday. ‘The original flight had cost £300, I had to pay another £100 to change the flight to the one leaving on Saturday. I live in Camden and it cost me £70 in a taxi to get here and it cost me £70 to get back. On her departure from the airport Mrs Ben Haj Fraj was surprised at the laissez-faire nature of staff. ‘My flight was an international one, so they should have taken me to international arrivals. They took me to domestic arrivals and let me out by myself so that’s a breech. Then when I got my bags bag they were extremely damaged. 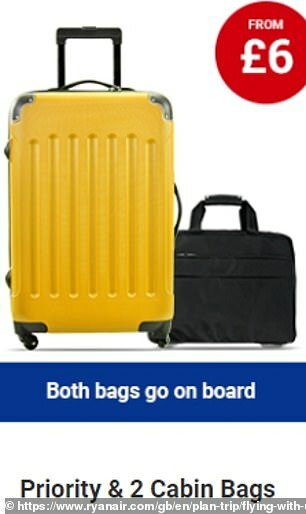 What exactly IS Ryanair’s baggage policy? From November 1, passengers can only take one small personal bag on board measuring 40x20x25cm that must fit under the seat in front. If you bring a second bag to the gate or you first bag is too big you will be charged a fee of £25. Passengers have to pay £8 to check in a 10kg bag. Passengers who pay for priority boarding – which costs £6 – will continue to be allowed to take both a ‘personal bag’ and small suitcase as hand baggage. ‘I’m really ill – I have disability letters from the hospital, I collapsed at the gate and staff just walked past me. This will be the last time I travel with Ryanair. Their new policy is complicated. The airline yesterday waived some of its controversial new baggage fees yesterday amid confusion among thousands of passengers at airports. From yesterday, the airline no longer allows passengers to take a small suitcase in the hold for free, forcing them to pay a minimum of £8 for any bag that won’t fit under the seat in front. 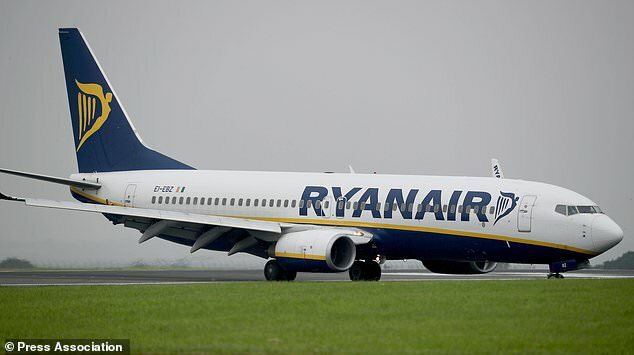 Passengers across the UK have branded the policy ‘outrageous’ and many said that it was ‘typical Ryanair’. Emma and Andrew Rutherford, from Kingston, south west London, were catching a Ryanair flight to the south of France, where they regularly stay at their holiday home. The couple always use Ryanair, which has the most convenient route to Bergerac, and will be regularly affected by the new fees. 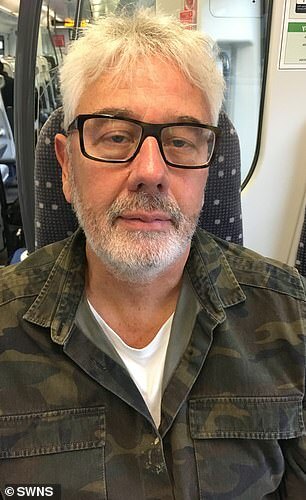 Mr Rutherford, 58, a co-owner of a recruitment firm, said: ‘You might as well quadruple the price of their flights because you end up paying so much more than they say you will. ‘They are not doing themselves any favours. You can pay £9.99 for the flight and then £69 in add ons. The stringent new rules have led to confusion among many who have pointed out that if they pay for priority boarding – which costs £6 – they will continue to be allowed to take both a ‘personal bag’ and a small suitcase as hand baggage. Craig and Gina Steventon, from Lancashire, paid £12 each for Priority Boarding on a return flight to Pisa in Italy when they were warned by the airline they would otherwise have to pay £8 each for their hand luggage. Craig, a 57-year-old business consultant, said: ‘It’s ridiculous. 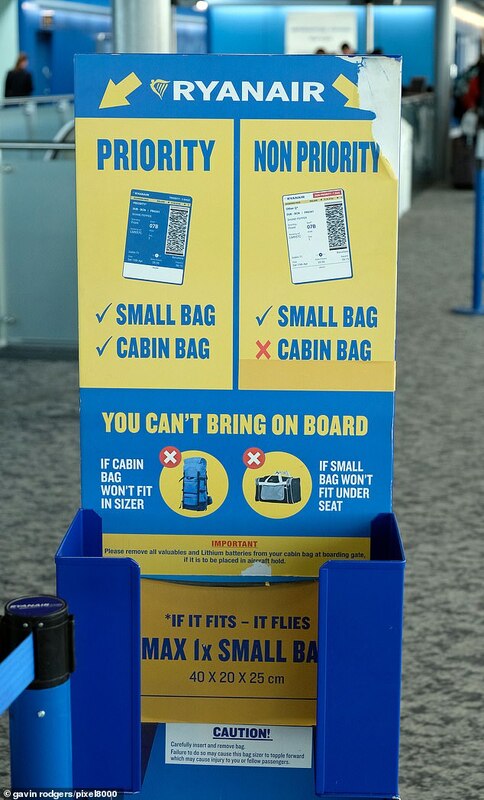 It’s just so typical of Ryanair. ‘You half expect it from them now – you think your getting a cheap flight but it’s not. ‘Our flights started off at £78 and it ended up being about £200 in the end because of all the add ons. 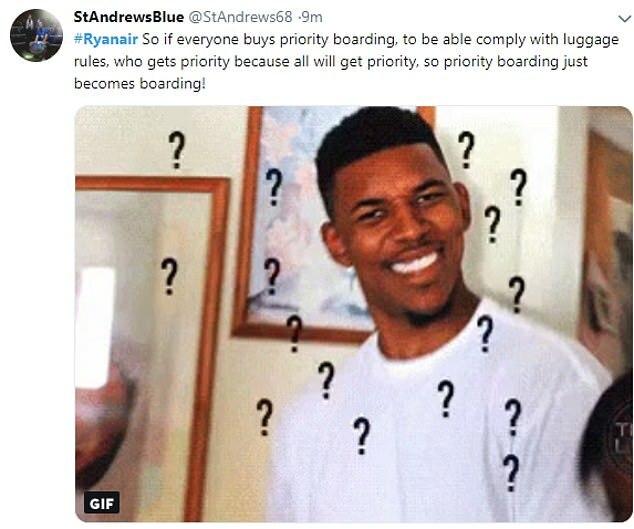 ‘And £24 of that was for the priority boarding that we didn’t even need as now they are letting people on with their cases for free because of all the confusion. Wife Gina, 58, said: ‘We should get a refund. 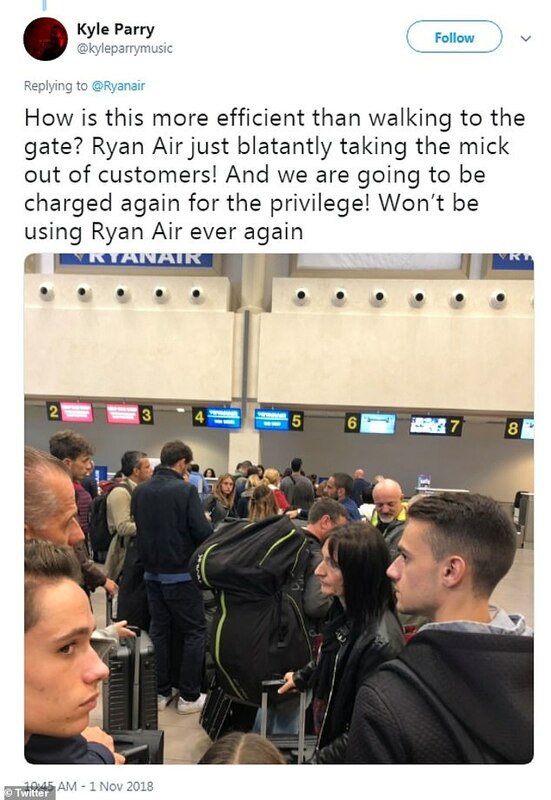 ‘Ryanair need to refund us for the money we have wasted on a Priority Boarding we didn’t need, now they are letting other passengers off without paying for their cases. ‘They told us the charges were coming in so we booked Priority Boarding which turned out to be a waste of money. ‘Everything is an add on all the time. ‘We even had to pay £28 to sit together on the flight, otherwise Craig would have been sat at the front and I would be stuck at the back. 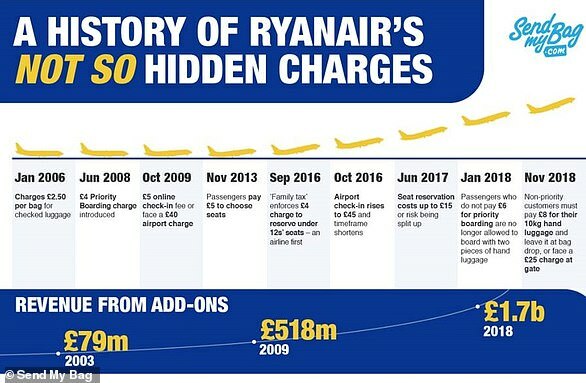 Ryanair said the change, which was announced in August, ‘was necessary to reduce delays’ but many have labelled it a ‘rip off’ and threatened to boycott the airline. One couple branded the airline ‘outrageous’ after they were faced with the new charges at the airport. 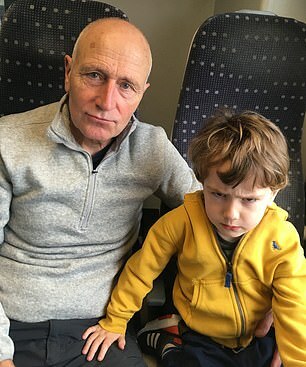 Retired married couple, Maggie and Dennis Norman, were returning home to Belfast with their two grandsons Adam, 15, and Angus, four, after spending three days in London. Husband Dennis, a 64-year-old retired teacher, said: ‘It is outrageous but it’s so typical of Ryanair. We didn’t even know about the additional hand luggage charge. ‘I didn’t see it in the booking details. It was just attached underneath in the fine print after we checked in. ‘When we found out, we couldnt believe they were charging for it, but obviously they are. You would have thought they would give us a bit of notice. Maggie, a 67-year-old retired civil servant, said the new restrictions were absolutely ridiculous. She said: ‘We have a good pension but all the extra charges, they all add up. Whatever airline has the best price is what we go for. Usually the best price would be Ryanair but now, with all these add ons, it won’t always be the case. ‘When we booked a few weeks ago, it wasn’t mentioned about the new baggage charge. It was only when I checked us in yesterday when we saw it. 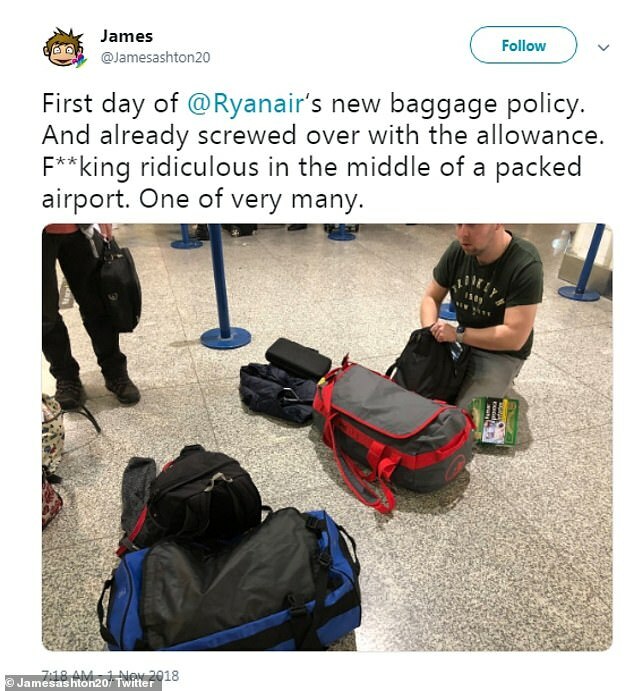 ‘Ryanair used to let you travel with hand luggage for free. Then earlier this year, we had to have our hand luggage put in the hold, but still at no extra cost. Earlier this year the airline’s CEO, Michael O’Leary, admitted that letting passengers check cabin bags at the gate was causing chaos and a ‘handling issue’ on flights. But he has found himself under fire from beleaguered customers today. 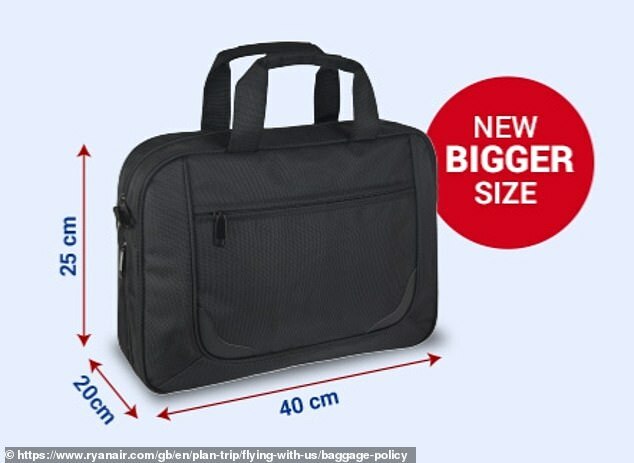 In January, Ryanair began a policy which saw passengers who had not bought priority boarding permitted to take a ‘personal bag’ – such as a handbag – on board while a second, larger bag – such as a wheelie suitcase weighing up to 10kg – could be put in the hold free of charge. But this resulted in up to 120 bags being tagged at boarding gates for each flight, meaning departures were disrupted. 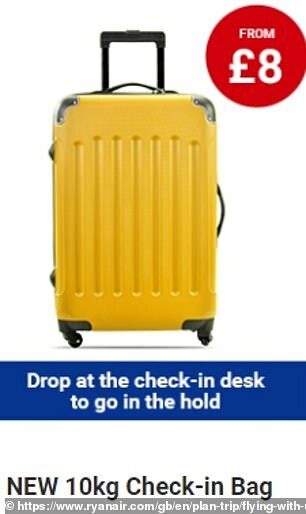 Ryanair has responded by no longer allowing any luggage in the hold free of charge. 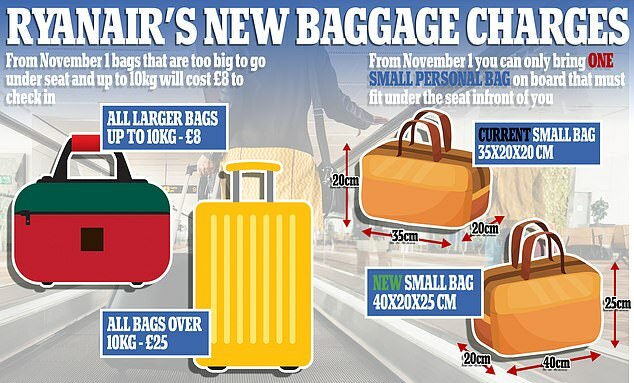 Passengers have to pay £8 to check in a 10kg bag. The previous lowest price for checked luggage was £25 for up to 20kg, which remains an option for those with heavier cases. The maximum size of ‘personal bags’ allowed on board has been increased by 40%. 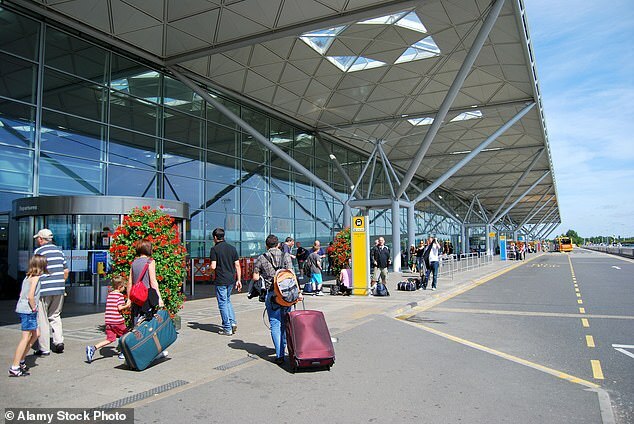 It claimed most passengers will be unaffected by the changes, as 30% already buy priority boarding and a further 30% travel with only a ‘personal bag’. Some check-in staff suspended the new charge at boarding gates today, in the wake of confusion and anger among passengers. 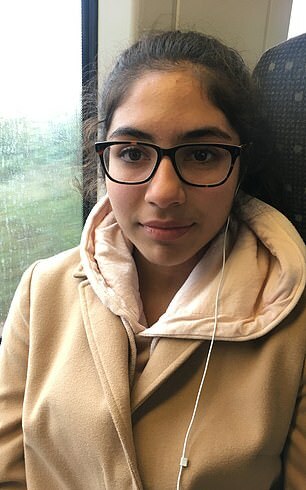 Rapinder Kaur was travelling from London Stansted to Venice with her 14-year-old daughter Hannah Bennet today. The 54-hear-old, from Canterbury in Kent, said: ‘This is the last add on charge I can take. It’s very annoying. ‘I would absolutely fly with another airline after these new hand luggage restrictions. ‘It is just another reason not to travel with Ryanair. It would have cost us another £40 to sit together in total so we are seated in different parts of the plane. ‘Then there’s the late check in fee so if we have problems with our WiFi at the hotel in Venice, we could be charged another £55 on top of we have to check in at the airport. A statement on the airline’s website read: ‘Main benefits of this new policy will be reduced flight delays and cheaper checked bag option. 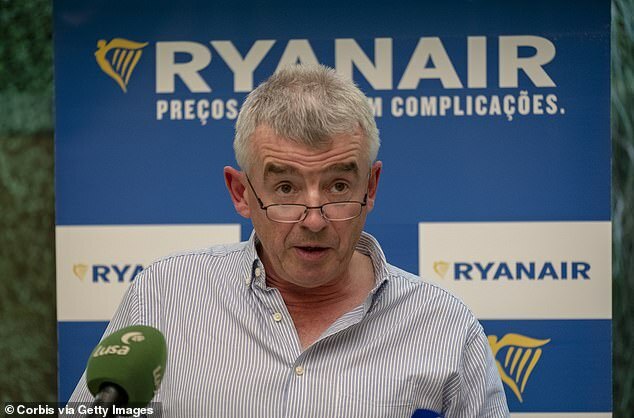 Ryanair insists it does not expect to make more money from the new rules, as it will lose revenue from passengers with checked bags switching from the £25 fee to the £8 option.